Juin embellit le sol et métamorphose le jardin de colorants dans une palette de teinture. 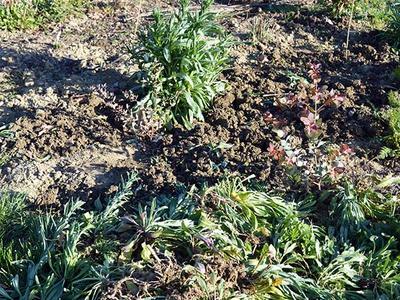 Ici, vous pouvez jeter un coup d'oeil sur certaines plantes du jardin de teintures en ce moment . Ces graines de guède radiants donneront non seulement la culture de guède prochaines années, mais aussi donner cette belle violet foncé à la laine ou de tissu. 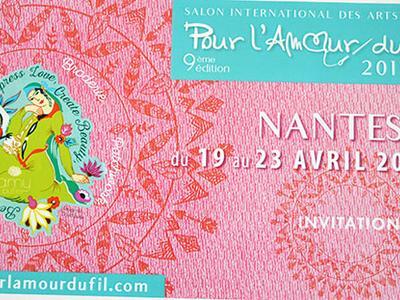 We are very much looking forward to once more being at Pour l'Amour du Fil in Nantes from April 19th - 23rd. We will be on stand D21 and as usual we will have our three wools in loads of naturally dye colours, some new kits including Fresco by Kieran Foley and an opportunity to take part in a competition. Discussions: Les commentaires sont fermés. 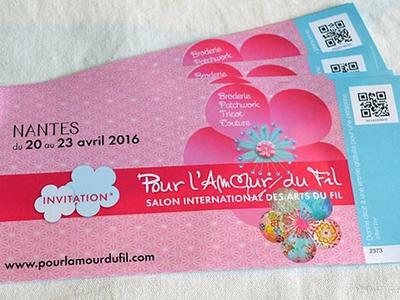 Nous sommes très impatients d'être de nouveau à Pour l'Amour du Fil à Nantes du 19 au 23 avril. Nous serons sur le stand D21 et comme d'habitude nous aurons nos trois laines teintes en couleurs vives, les kits de crochet et de tricot, favoris et nouveaux, y compris Fresco Crescent par Kieran Foley et l'occasion de participer à un concours. 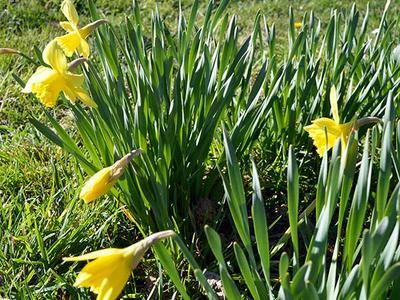 Wherever you are in the world, when the daffodils start flowering, that is the time to sow the woad seeds for the coming years blue harvest. 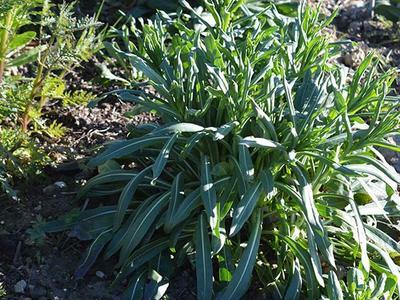 It is a good idea to select a few good plants to allow to go to seed for next years sowing and to remove all the other woad plants before the seeds engulf your neighbourhood and beyond. 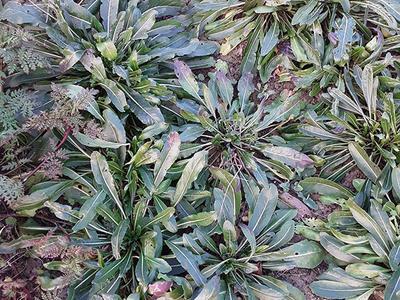 Woad is classified as an invasive plant in some areas. 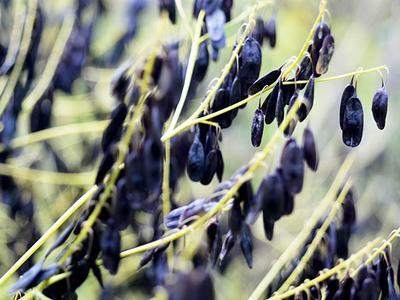 Leave the culled plants to dry a little before adding them to your compost heap. 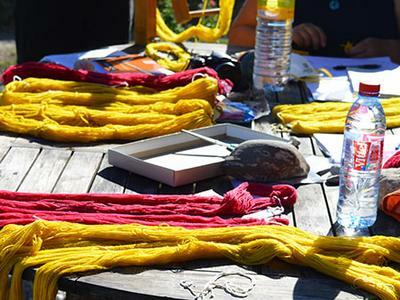 This year there will be fully hands-on natural dye workshop, here at my dye house in Montbel from August 21 to 25th. This workshop will take only 6 students, so book early. .The workshops will be conducted in English but French will also be used and the handouts are in both languages. Please use the contact page to ask any questions and register your interest. The Autumn was a busy time at Renaissance Dyeing both professionally and personally so no time was found to publish an Autumn Newsletter. For those who are new subscribers, normally you can expect a newsletter at least each season if not more often. What news for Spring 2016? Adriaan and me are very busy (as usual) preparing for the Nantes salon: Pour l,'Amour du Fil which will be at the Nantes Expo Parc from April 20th - 23rd. We are looking forward to our first visit to Nantes and we will be taking lots of the crewel wool. We also have free tickets to give away. Leave a comment on this newsletter on our blog pages AND 'Like' the Renaissance Dyeing facebook page to enter into the draw. Winners will be contacted before April 10th. Quelles nouvelles pour le printemps 2016? We have been asked to do more workshops, so this year we have set two as jewels either side of the summer holidays: July 4-8th and August 22-26th. Each workshop will take only 6 students, so book early. .The workshops will be conducted in English.